It’s that time again! Free sake tasting for everyone! 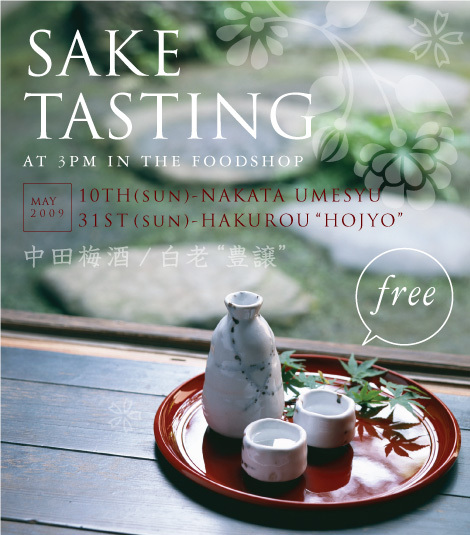 On Sunday 10th we are offering the chance to taste Nakata Umeshu: a premium plum wine which is sweet and fruity. On Sunday 31st it’s Hakurou Hojyo‘s turn to be tasted: a light, clean tasting sake that’s delicious served cold or warm. Come to the Foodshop from 3pm at Japan Centre, 213 Piccadilly, London. Look forward to seeing you there! Posted in Food and tagged sake tasting. Bookmark the permalink. I love sake! Wish I can be here, I heard the best sakes all over Japan is featured here. SAKE and Japan really interest me a lot. I would agree with a lot of readers here praising sake’s unique blend of taste.